The cytoplasm of anaerobic ammonium oxidizing (anammox) bacteria consists of three compartments separated by membranes. It has been suggested that a proton motive force may be generated over the membrane of the innermost compartment, the “anammoxosome”. 31P nuclear magnetic resonance (NMR) spectroscopy was employed to investigate intracellular pH differences in the anammox bacterium Kuenenia stuttgartiensis. With in vivo NMR, spectra were recorded of active, highly concentrated suspensions of K. stuttgartiensis in a wide-bore NMR tube. At different external pH values, two stable and distinct phosphate peaks were apparent in the recorded spectra. These peaks were equivalent with pH values of 7.3 and 6.3 and suggested the presence of a proton motive force over an intracytoplasmic membrane in K. stuttgartiensis. This study provides for the second time—after discovery of acidocalcisome-like compartments in Agrobacterium tumefaciens—evidence for an intracytoplasmic pH gradient in a chemotrophic prokaryotic cell. Anammox bacteria constitute a deeply branching monophyletic group inside the phylum Planctomycetes (Strous et al. 1999; Jetten et al. 2009). They grow by the anaerobic oxidation of ammonium with nitrite as the electron acceptor, leading to the direct production of dinitrogen gas, N2 (Van de Graaf et al. 1996). Although overlooked for almost a century of research on the nitrogen cycle, the anammox process is now known to play a major role in the production of N2 in a wide variety of (marine) ecosystems (Schmid et al. 2007) and is currently applied in wastewater treatment (Van der Star et al. 2007). All Planctomycetes have a differentiated cytoplasm with different intracytoplasmic compartments separated by membranes (Fuerst 2005). Anammox bacteria have three compartments (Fig. 1; Strous et al. 1999; Lindsay et al. 2001; Van Niftrik et al. 2008): (1) the “riboplasm” which contains the chromosome and ribosomes, (2) the “anammoxosome” located inside the riboplasm, and (3) the “paryphoplasm” that surrounds the riboplasm much like the periplasm surrounds the cytoplasm in Gram-negative bacteria. However, the Gram-negative periplasm is in open contact with the cell’s surroundings via porins in the outer membrane, whereas both genomic (Strous et al. 2006) and experimental (Van Niftrik et al. 2008) evidence suggest that the paryphoplasm is not open to the environment and should be considered a cytoplasmic compartment. Whether the paryphoplasm is a true intracytoplasmic compartment as in other Planctomycetes (Lindsay et al. 2001) or whether it should be regarded a “special” periplasm—as is suggested by genome analysis (Strous et al. 2006)—is presently not clear. For anammox bacteria, it was previously suggested that the anammoxosome contains the enzymes involved in anammox catabolism and that a proton motive force is generated over its membrane (Lindsay et al. 2001). The recent observations that all or most cytochrome c proteins of anammox bacteria reside inside the anammoxosome (Van Niftrik et al. 2008) and the identification of key catabolic enzymes hydrazine oxidase and hydrazine hydrolase in purified anammoxosomes (Karlsson et al. 2009) is consistent with this idea. Ladderane lipids are the most abundant membrane lipids of anammox bacteria (Rattray et al. 2008). These lipids contain concatenated cyclobutane rings and may therefore make the membranes less permeable to solutes and protons (Sinninghe Damsté et al. 2002). The slow growth rate of anammox bacteria—doubling time of several days (Strous et al. 1998; Tsushima et al. 2007; Van der Star et al. 2008)—continues to be a major challenge in anammox research. The inability to grow anammox bacteria (possibly as a result of the slow growth) in pure culture only adds to this challenge. Enrichment cultures (with typical enrichment levels of 50–90% of the population; e.g., Schmid et al. 2000; Egli et al. 2001; Strous et al. 2006; López et al. 2008) are the only source of anammox bacteria for experimental investigation. Because of the relatively large non-anammox population (10–50%) in such cultures, additional physical purification of anammox cells (i.e., with Percoll density gradient centrifugation; Strous et al. 1999) is necessary for unambiguous results. However, the recent enrichment of the anammox bacterium Kuenenia stuttgartiensis in a membrane bioreactor (Van der Star et al. 2008) makes it possible to obtain large amounts of suspended cells with a high degree of enrichment (up to 97.6%), which has enabled the experiments of the present study. In this study, the nature of the intracytoplasmic compartmentalization of cells of K. stuttgartiensis was addressed with in vivo 31P NMR. In this approach, the shift of the HPO 4 2− /H2PO 4 − peak can be directly related to the HPO 4 2− /H2PO 4 − ratio and can thus be used to detect intracytoplasmic pH differences. The method has previously been successfully applied to estimate the (relatively acidic) vacuolar pH in several plants (Roberts et al. 1980), bacteria (Castle et al. 1986), yeasts (Nicolay et al. 1982), and fungi (Hesse et al. 2000), as well as in mitochondria (Ogawa and Lee 1984) and in thylakoid membranes in cyanobacteria (Belkin et al. 1987). In the case of thylakoids and mitochondria, the pH difference between the mitochondrial matrix and the cytoplasm constitutes the pH component of the proton motive force and has been shown to be a good indicator of cell activity. If the anammoxosome is indeed the locus of anammox catabolism, generation of a proton motive force over its membrane would be expected. The present study provides further evidence for this concept by showing that two distinct and stable HPO 4 2− /H2PO 4 − ratios are present in active cells of K. stuttgartiensis. Biomass for all experiments was harvested from an 8 L anammox membrane bioreactor (MBR), fed with synthetic medium (details in Van der Star et al. 2008). The biomass retention time was 12 days, corresponding to a doubling time of 8.3 days. At the time of harvesting, the biomass concentration in the MBR was ca. 2 g-carbon/L, and the conversion was 50 mM NH 4 + /day. K. stuttgartiensis (100% sequence similarity of the 16S rRNA with the Kuenenia from the Kölliken enrichment) was the only anammox species that could be detected (with fluorescence in situ hybridization) and constituted 97.6% of the population (Van der Star et al. 2008). 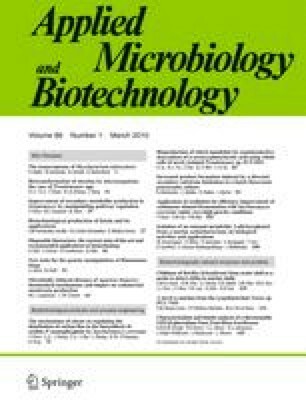 Biomass collected during 3–4 days was concentrated 100 times in a single centrifugation step and used for in vivo NMR experiments within 24 h after concentration. The biomass produced by this procedure was dark red and highly viscous, but still liquid. Further concentration was not possible and led to degradation of the biomass, resulting in extensive foaming. Cells remained in suspension up to 5 days after preparation. 31P NMR spectra were recorded at 121.5 MHz on a Bruker AV-300 (Bruker Rheinstetten, DE, Germany) wide-bore spectrometer equipped with a 31P/13C probe (diameter 20 mm) and collected in 60-min blocks of 6,700 scans. Temperature was controlled at 298 K. Spectra were calibrated by the NADH/NADPH peak at 10.9 ppm. pH values were determined by comparing the pH-sensitive shifts of inorganic phosphate in the cytoplasm with a calibration curve for inorganic phosphate (Den Hollander et al. 1981). For the experiment, the 20 mm NMR tube was employed as a miniature fed-batch reactor (Fig. 2). Ten to fifteen milliliters of concentrated biomass was added to the NMR tube. Mixing and anoxic conditions were maintained by sparging continuously with N2. Ammonium nitrite (200 mM) was added as the substrate via a syringe pump at 1 mL/h for 1 to 20 h. The first spectra were recorded without substrate supply or N2 flushing. Subsequently, spectra were recorded for 1–2 h while the tube was flushed with N2 without substrate supply. Finally, spectra were recorded during 1–4 h with substrate supply and flushing with N2. For experiments at different external pH values, the concentrated cell solution was buffered with 200–400 mM HEPES (4-(2-hydroxyethyl)-1-piperazineethanesulfonic acid) buffer at pH 6.5, 6.9, 7.4, and 7.8. After 1 h of anoxic conditions without substrate supply, 200 mM ammonium nitrite solution was added for 2 h.
The cell suspension was harvested from the membrane bioreactor, concentrated to 15 mL, transferred to a 20 mm (i.d.) wide-bore NMR tube, and mounted into the 300 MHz NMR machine, which was tuned for 31P at 121.5 MHz (see “Materials and methods”). K. stuttgartiensis was shown to constitute 97.6% of the cells in the suspension. The 31P NMR spectra for this experiment are shown in Fig. 3. Initially, the suspension was supposedly oxic, since no efforts were made to maintain anoxic conditions and the oxygen consumption rate of the suspension was below the detection limit (Van der Star et al. 2008). The initial spectra displayed two distinct peaks: the first at 2.52 ppm (corresponding to pH 7.1, which was the medium pH) and a peak of lower intensity at 1.55 ppm (corresponding to pH 6.4, see Fig. 3 I). After removal of any remaining oxygen by N2 sparging, the peak at 2.52 ppm (pH 7.1) shifted to 3.1 ppm (pH 7.8) but retained its shape (Fig. 3 II). Because of this peak shift, a shoulder in the recorded spectrum became apparent (2.84 ppm, pH 7.4; Fig. 3 II and III). pH measurement at the end of the experiment confirmed that the pH of the solution had shifted to 7.8 and that the 3.1 ppm peak could thus be assigned to the extracellular environment. Although metabolic activity could be also of importance, this pH increase was probably due to the removal of CO2 from the medium which was not sufficiently buffered. During N2 sparging, the smaller peak at 1.55 ppm shifted to a slightly more acid value (1.43 ppm, pH 6.3, Fig. 3 II and III). After the induction of anammox activity by substrate supply, the peaks remained at these values (Fig. 3 IV and V). To investigate the stability of the observed peaks, K. stuttgartiensis cell suspensions were harvested, concentrated, and resuspended in HEPES buffers with different pH values. Figure 4 shows the intra- and extracellular pH values derived from the recorded spectra and confirms that the position of the main peak corresponded to the external pH. Furthermore, the peak, which was previously present as a shoulder at pH 7.4, as well as the smaller peak at pH 6.4 always remained at the same positions. At medium pH 6.9 and 7.4, only two peaks were present (at the medium pH and at pH 6.3) as the compartment responsible for the peak around 7.3—7.4 ppm was too close—or equal—to the medium pH to a give a clearly independent peak/shoulder. To show that the K. stuttgartiensis cells had been active in the previous incubations, spectra were also recorded during a longer time (4 h, 26,800 spectra) to increase the sensitivity in order to enable the detection of phosphate-containing organic metabolites. Besides the abovementioned peaks of the inorganic phosphate species, these spectra showed peaks at −18.6, −10.8, −5.2, −0.8, 4.1, and 4.5 ppm (Fig. 5). The peaks at −18.6 and −5.2 could be ascribed to γ- and β-ATP, respectively, whereas the peak at −10.8 was NADH/NADPH. The peak at −0.8 is consistent with phosphoenolpyruvate (PEP). The peaks above 4 ppm may indicate the presence of a phosphate esthers (a monoesther at 4.5 ppm and a diesther at 4.1). No signs of poly-phosphate were found. The experiments clearly showed that apart from the external medium, two intracytoplasmic compartments were present with pH values of 7.3 and 6.3. These pH values were maintained over an external pH range from 6.5 to 7.8 (Fig. 4). This observation can be explained in several ways. Firstly, it may be possible that the two pH values resulted from two different populations. However, since the cell suspension that was used contained only very few cells that were not K. stuttgartiensis (Van der Star et al. 2008), this is unlikely. Even if other bacteria contributed to the NMR signal, a minor contribution to the pH 7.3 peak would be expected rather than the production of a second acidic peak at pH 6.3, since the cytoplasm of these—presumably uncompartmentalized—contaminants would be expected to have neutral or slightly alkaline pH relative to the external medium. Second, it may be possible that the K. stuttgartiensis population was in two different physiological states, resulting in two distinct pH values of the cytoplasm. This was also unlikely, because vigorous mixing of the NMR tube by sparging of N2 and addition of substrates did not cause the disappearance of either of the two peaks. Thus, the population must have been physiologically homogeneous. Third—and most plausibly—the two peaks may have resulted from the presence of two intracytoplasmic compartments with different pH values. The allocation of the peaks to different compartments (anammoxosome, riboplasm, and paryphoplasm) cannot be assessed directly by 31P NMR. Although the allocation of peaks to specific compartments is usually verified with pH-sensitive fluorophores, this is impossible for K. stuttgartiensis, since these molecules cannot pass the ladderane membranes of living anammox bacteria (Sinninghe Damsté et al. 2002). If the anammoxosome indeed plays a role in energy generation (see below), then a pH gradient would be expected over the anammoxosome membrane. All presently available experimental evidence indicates that the final metabolic step of the anammox catabolism–hydrazine oxidation to dinitrogen gas (Van de Graaf et al. 1997; Strous et al. 2006; Karlsson et al. 2009)—takes place inside the anammoxosome. This step feeds four electrons into the respiratory chain and simultaneously releases four protons. Thus, this step has the potential to acidify the anammoxosome and build up a proton motive force over its membrane. The attribution of the lower pH value of the present study to the anammoxosome is therefore the only one consistent with previous experimental evidence. The detection of two compartments at different pH is not necessarily inconsistent with an anammox cell consisting of three separate compartments. In the first place, it is possible that no pH gradient exists between two of the three compartments (for example the riboplasm and the paryphoplasm). Second, it is possible that no pH gradient exists between the paryphoplasm and the external medium. That would be expected if the anammox paryphoplasm is actually more similar to the Gram-negative periplasm (Strous et al. 2006). Finally, the third compartment may have been too small (and/or may not contain enough phosphate) to be visible with 31P NMR. Follow-up studies will have to provide further evidence for these conclusions by investigation of the response of the observed differences in pH to different physiological conditions (e.g., de-energizing the pmf by inducing starvation or the addition of uncouplers). Since the proton motive force in general is constant for a given organism, also a more or less constant pH difference is expected between the two sides of the membrane over which the proton motive force is created. In bacteria, this generally results in a constant pH difference between the outside pH and the cytoplasm. In the investigated anammox bacterium, this constant difference was not found. But since two internal compartments exerted a pH which was independent of the outside pH, it seems logical that the proton motive force was generated over this membrane. To our knowledge, cyanobacterial thylakoids (Belkin et al. 1987) and the acidic acidocalcisome-like compartment in Agrobacterium tumefaciens (Seufferheld et al. 2003) are the only other reported compartment in a prokaryote, in which the proton motive force was shown to take place. The proton motive force in bacteria generally constitutes a more or less constant potential of circa 150–200 mV. If the proton motive force is generated over the anammoxosome membrane, with a pH difference of 1.0, then the pH component of the proton motive force is circa 60 mV for K. stuttgartiensis. If our interpretation is correct, the anammoxosome is functionally similar to mitochondria in eukaryotic cells as both these compartments (organelles) would provide the cell with energy in the form of ATP. Also the pH difference between mitochondria and the cytosol in eukaryote—e.g., 35–53 mV for rat liver (Ogawa and Lee 1984) and 60 mV in human hepatocytes (liver cells, Hoek et al. 1980; Strzelecki et al. 1984)—is similar to the estimated pH difference found between the anammoxosome and the cytoplasm. In contrast to the anammoxosome, the pH in mitochondria is—instead of being more acidic—about one unit more alkaline. Therefore, the orientation of the membrane-bound ATP synthases must be reversed compared to mitochondria (and thus similar to the cyanobacterial intrathylakoid space): Whereas in mitochondria the ATP synthesizing domain of the ATP synthase is directed toward the mitochondrial matrix, it can be expected to be directed toward riboplasm in anammox bacteria (Van Niftrik et al. 2004). A similar orientation was shown for ATP synthases in the intrathylakoid space, in which the compartment is also the more acidic then the cytoplasm. In the latter case however, much larger pH differences are found (Belkin et al. 1987). The production of PEP immediately upon energizing the system is consistent with the acetyl CoA route, which is the most probable CO2 fixation pathway of anammox bacteria (Schouten et al. 2004; Strous et al. 2006). The production of this metabolite upon addition of the substrates ammonium and nitrite is another indicator that the cells were actively metabolizing during the experiment. The same can probably be concluded from production of the (unidentified) phosphate mono ester. We thank Mike Jetten, Laura van Niftrik, and Boran Kartal for helpful discussions. This research was supported by the Technology Foundation STW (grant NPC.5987).